Sugar, Spice, Etc | In the kitchen and everywhere else. We’ve moved into May and it’s not getting any cooler. And my earnestness to cook as little as humanly possible is not slowing down either. 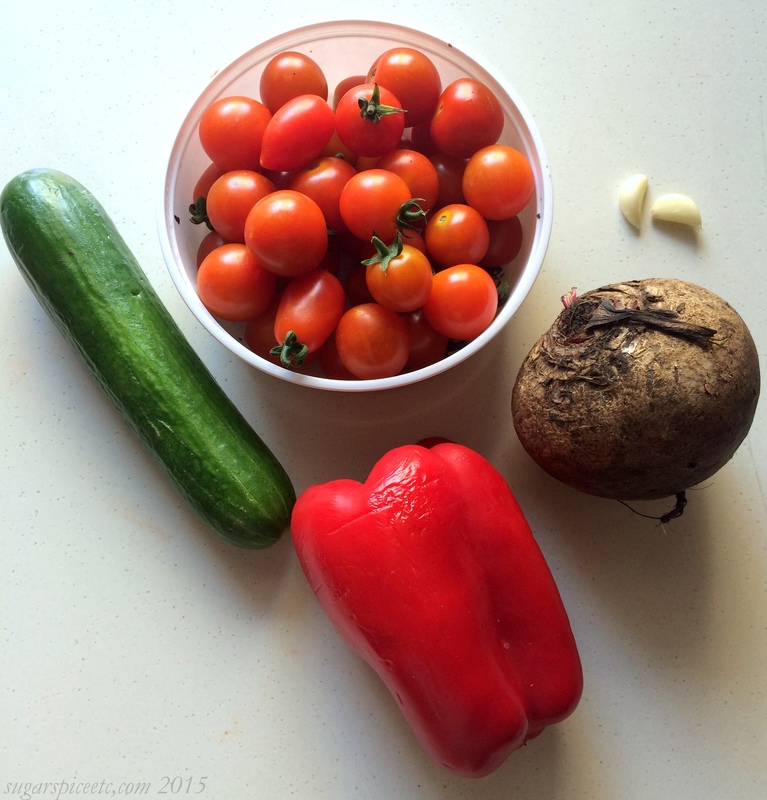 As you may have inferred from the last few posts, summer in my kitchen = salad. I sometimes eat leftover salad for breakfast, with a cold hard-boiled egg sliced in. The great thing about salads is that if they if greens aren’t the core ingredient, chances are, they’ll keep longer. Which is why I use a lot of dried beans and legumes as a base for salad. Chickpeas are great, and rajma or kidney beans can also be used to make a great salad- especially if you want to switch up your routine from regular rajma-chawal. 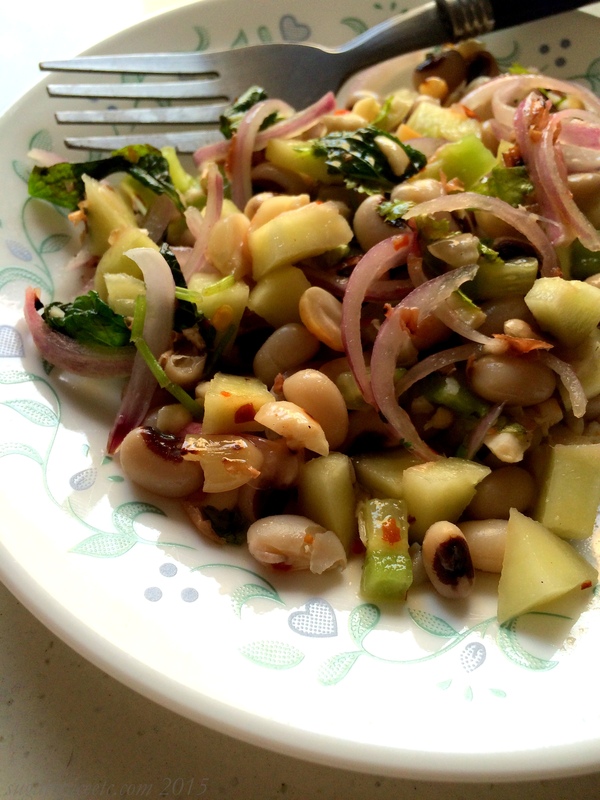 Lobia or black eyed peas are as good a dried bean as any to make a salad. I usually cook them rajma-style, putting everything- the lobia, spices, tomatoes, et al- into the pressure cooker and letting it whistle away for a while, and then eating the curry with rice or roti. But then that can get boring. So I took it upon myself to make lobia fun and colourful! The peas are quite pretty to look at on their own- what with their little black eyes and creamy skin- and they are a solid structure for a filling salad. Of course, when you begin to type black eyed peas into Google, you will invariably end up being directed to the band, not the legume. So after I Googled black eyed pea recipes, I found my way, as I usually do, to Food52. Sometimes I wonder why I even bother Googling when I can just search straight on Food52. An article for One Pot Of Black Eyed Peas, 5 Dinners linked me up with 101 Cookbooks. If there’s a tastier way to eat a whole grain, legume, leaf or egg, then Heidi Swanson has been there, done that. Swanson paired her cooked beans with curry powder, red onions, lentils and ginger- so some spice and sharpness to balance the creamy cooked beans. I decided to make it a little more tropical, adding raw mango or kairi, and some cucumbers and red onions. I like adding to kairi salads- it adds a nice bite and tartness and sharpness that lends an element of surprise 🙂 I wanted the flavours to be reminiscent of som tam, but without any soy or fish sauce. I stuck to a coconut-chilli-lime dressing and lots of fresh mint, cilantro and crushed toasted peanuts, for a little Thai flavour note. Put all the salad ingredients in large bowl and toss well to combine. Whisk together all the dressing ingredients in a separate bowl until evenly incorporated. Pour dressing over the salad and serve chilled. As you may have inferred from my last few posts- it is getting uncomfortably warm in these parts. Just really, really still, dry heat; the kind that drains you and makes you want to jump into a pool any chance you get. Hence, I feel the need to consume lots of coconut water and lime juice and prepare meals which are light on the stomach and cold on the tongue. I’ve never made a gazpacho before, even though I’ve watched it being made on television, listened to podcasts outlining the perfect gazpacho, and saved numerous recipes to my Evernote. I haven’t attempted any of those, so in some ways, this is my “gateway” gazpacho. I decided to make this because I didn’t have any bread for a regular gazpacho, but I had a pair of beets. I always have beets in my fridge. You’d think that the one constant ingredient in my fridge would be eggs or bread or limes or herbs, but in my case, it’s beets. I buy them each week, so there’s always a spare beet nestled somewhere in the crisper, patiently waiting it’s turn as the kale, spinach, mushrooms and cherry tomatoes make their way to our plates first. Potatoes-onions-tomatoes are a must in any Indian kitchen. My son loves cucumbers and eats a plateful of sliced cucumbers everyday with salt and pepper, so there must always be a handful in the crisper. And beetroots are great because they stay well (they don’t seem to spoil as easily as other vegetables,) plus, they are so cheap year-round. And they are so, so good for you! I can make them Kerala-style, as a thoran or pachadi; I can roast them whole, boil them and pour some brown butter over for a warm salad- beets are a very versatile vegetable. And great for juicing, too! So, continuing with my no-cook theme, I zoned in on the beetroot gazpacho recipe from Rachel Allen’s Easy Meals. Except there was some cooking involved- I parboiled the beetroot. My blender is a regular one, not a Vitamix, and I don’t own a food processor either, so I wasn’t sure how well raw beets would break down. Other than the boiling, all you do is blitz the stuff you see above in a food processor or blender and push it through a sieve. I swapped the sherry vinegar in the original recipe for balsamic- because that’s what I had. And since the soup is a deep purple anyway, the balsamic doesn’t discolour it, just adds a really nice depth of flavour.This soup is refreshing with a nice, bright flavour- no single ingredient overpowers, it all comes together to make a nice, mellow cool spoonful. I finished mine with a touch more acid- some lemon- and a pinch of pink Himalayan salt, because I got a phancy little box with assorted salts. And why not add some pink on top of purple? Peel the beetroot and plunge into boiling water. Cook for a few minutes until tender; a knife should be able to go through easily but not all the way through. Allow the beetroot to cool, then roughly chop it. Pour the puree through a sieve set atop a large bowl. Press down against the mixture with the back of a spoon to get all the liquid through. Stir in the olive oil, balsamic vinegar and season with salt and pepper. Serve chilled, with a squeeze of lime and a sprinkling of salt and pepper on top. There was this head of purple cabbage in my fridge that had been forlornly staring back at me for about a week. I bought it telling myself I’d make a shredded cabbage salad, but each day I’d plan a menu that just didn’t call for any kind of cabbage salad. So finally, as the heat got to me and the desire to actually cook just melted away, I reached for the poor cabbage before it wilted to death and decided to show it some love- with a bright dressing, fresh mint and sharp red onions. The outer leaves had to be chucked, though- too much neglect. 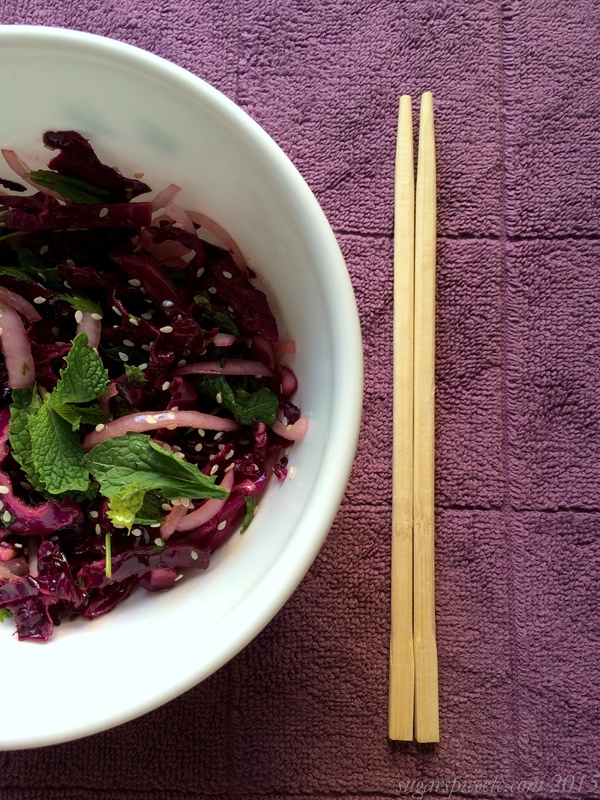 I made this salad with a little inspiration from the Korean Slaw recipe in It’s All Good. This salad is quite refreshing and light on it’s own, and makes a great side to stir-fry or noodles. I mixed some of the salad with cold soba noodles and toasted sesame oil to make it a one-bowl meal. If you top that with a protein, like chicken, fish, beef or tofu, then you have yourself a pretty substantial meal. I love the colours of the salad- once the dressing is mixed in, the purple cabbage bleeds a little bit of it’s colour into the onion, so everything is jewel-toned and glossy. And the mint is just gorgeous, both in terms of colour and flavour- be sure to use the freshest mint you can get your hands on. Whisk all the dressing ingredients together in a small bowl and set aside. Toss the cabbage and onions together in a salad bowl. Pour the dressing over, mix well. Scatter the sesame seeds and mint over the top and mix again. Top with a sprig of mint. Allow the salad to sit covered in the fridge for 15 mins to half an hour to let the flavours absorb.